The Drypers Little Day Out Carnival is back for a 2nd time! Promising a whole host of games, activities, rides and stage performances, Drypers Little Day Out will be even bigger and better this year. This year, the whole focus of the carnival will be on family so all the activities will be geared towards encouraging young and old to spend time on the things that matter while having fun at the same time. Watch out for family building activities such as cupcake baking for parents and children, gym and music sessions, speech and drama performances and even story-telling. There will also be a huge play area, a train ride and a pirate ship to keep your kids entertained! There will also be a charity drive to raise funds for needy families. All you have to do is purchase a Special Drypers Happy Pack (worth up to S$40) at just S$10-15 (depending on the type of diapers) and all proceeds will go to the KKH Health Endowment Fund, which supports mothers and children who lack resources when seeking medical help. 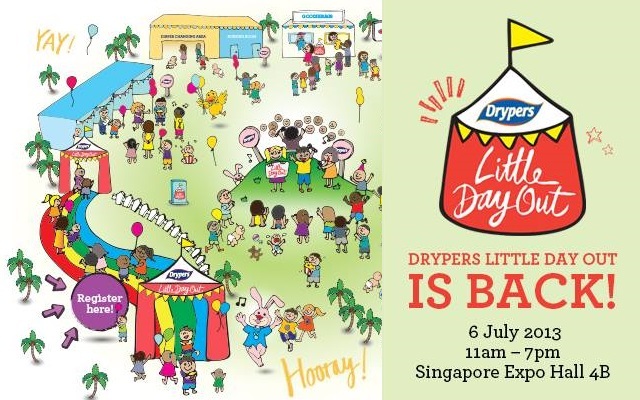 Register on-site at the carnival or visit Drypers Singapore Facebook Page (note that the event tab and registration form is not accessible via mobile devices). Each completed registration form admits one family. Disclosure: This is Part 2 of a series of sponsored stories on behalf of Drypers Singapore. All opinions are my own.